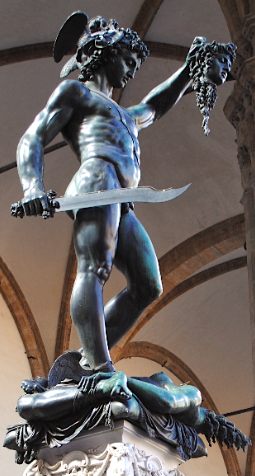 The sculpture of Perseus holding the head of Medusa is the first statue to be placed under the Loggia Dei Lanzi in 1554. The sculpture is the work of the Italian sculptor Benvenuto Cellini and depicts one of the first Greek Heroes in Greek mythology – Perseus. The sculpture shows Perseus holding the head of Medusa who was a gorgon monster. The sculpture was commissioned by the 16th century Duke of Florence, Cosimo I de Medici, and represents the eternal split with republican institutions. 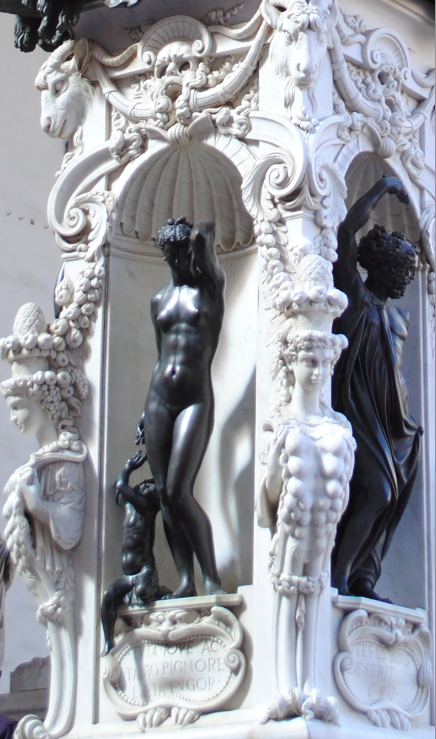 The four bronze statuettes that decorate the marble pedestal are Danae, Jupiter, Mercurius and Minerva. Danae was the mother of Perseus in Greek mythology, Jupiter was the King of Gods, Mercurius (or Mercury) was a Roman God and Minerva was the Roman Goddess of Wisdom.